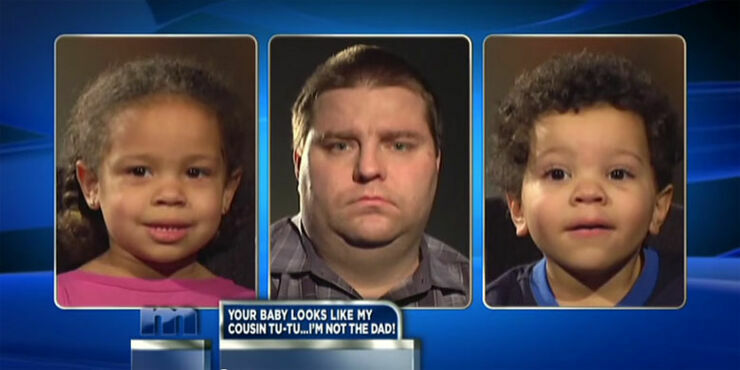 White Father Finds Out Black Twins Aren't His—Well Duh! It's not exactly the revelation of the century, but that's what denial will do for you. A white couple went on Maury because their four-year-old twins had a complexion which was somewhat darker than the Caucasian parents. It doesn't take a genius to figure out what may have gone on here, but Maury still goes ahead with the charade of taking a DNA test to tell, conclusively, that this guy is definitely not the biological dad. The poor guy, he wants to believe they're his because his fiance told him they are, but the truth is blatantly staring us all in the face. Denial is not a river in Egypt, dude. One YouTube commenter sums it all up perfectly in response to the fiance's continuing refusal to admit that something is very rotten on the state of this relationship; "I can't control what comes out! "....Yeah b#tch, but you can control what goes in!!" And that's why TV shows like this are just like crack cocaine, you know it's bad, you want to give it up, but you just want one more hit.